Discussion in 'Backpacking' started by Phisikos, Mar 22, 2016. A while back I got a Becker BK-2. I'd never handled a Becker knife before but lots of folks seemed to like them. I got it and I really, really liked it. What a capable knife. But at the same time, what a massive chunk of steel! I can hardly imagine you guys packing BK-7, BK-9 or a Machax. Might as well carry a machete. Or a khukuri, I suppose. Remember that the bk7 is 3/16" thick instead of 1/4". For that reason, the BK7 weighs a few ounces LESS than the BK2. 12.9oz vs a pound for the BK2. Day hikes I usually carry my Opinel Inox Garden knife, very affordable, and light weight. Inox holds up quite well in the Hawaiian salt air. Sometimes I lose knives, and losing an inexpensive Opinel doesn't hurt as much. Opinel the best bang for the buck in a folding knife. big belly jon, winter1857 and Mattexian like this. I would take a Fiddleback Forge Hiking Buddy (appropriately named) with me. 3" blade, about 7.5" long. It would pretty much handle anything I threw at it. I understand people who say SAK is enough... It really is... I never needed to chop wood for fire, always find dead wood around... Use SAK to make tent poles if someone has lost their... Cut packages, cordage, food.... Improvised fork few times, and almost always carve feathersticks out of small dead branches I find around. Never understood people who take heavy knives... I very often hike about 30 kilometers, and every gram counts, don`t like carrying something I don`t need, and if there is option that I need to cut wood and work with it, I would rather take small hatchet or better saw (bahco laplander), than carry some big knife which is not suitable for that. DirtNap, caoutdoorsman and aaronu like this. Wenger Standard Issue coupled with a Gransfors Mini. i'm loving the diverse answers. when i pack, it is long and far. i use a Mora companion that i cut the belt hook off the sheath..it is super light and super capable. the trout barely stand a chance. gutting fish is primary..
My mora robust.... any excuse to put it on my belt. thereandbackagain and DomC like this. There seems to have already been eleventy-two million 'one knife' threads. But this one has a better twist so, I will play along. In my pack right now is a Mora Bushcraft Black (light weight and a great backup blade). Now in a situation as you have suggested, I have been selected for Season 3 of Alone, my knife of choice would be, without a doubt, a Tracker/WSK knife as I am very proficient at almost all tasks with it. As has been already stated, I ALWAYS have an SAK Farmer in my pocket...ALWAYS! Out and about, I carry my Tracker in a cross draw Baldric Rig to keep it off of my right hip as that spot is reserved for a Glock. Growing up and hunting and hiking with my father, all of the years I spent in the U.S. Army doing assorted things I want talk about here, and all of the experience in all of the environments that I've seen, I've been able to come up with a couple of choices. Condor Village Parang is always either inside of my backpack, on a rope shoulder sling or on the outside or on my belt. Schrade Golden Spike that I've used for more than fourty years. A Buck 112 folder or for the last 20 or 30 years a Gerber 600 folder. I have other choices to pick from but what is listed hear is what I will take with out even thinking about it. I've got tomahawks, axes and other blades and implements but what I've listed take care of any need that I have. big belly jon, Thorns, lowtidejoe and 1 other person like this. I don't subscribe to the titanium everything super lightweight school. When I hike and camp I want to be comfortable and if I have to carry a little more weight than so be it. I'm in no rush to get somewhere so I can afford to stop for a rest and a water break. I usually carry a small hatchet, and my belt knife may be any number of blades, a Fiddleback Forge Duke, Blackbird SK-5, Esee 6, JK Kephart, or a Condor Kephart. In my pocket is usually a good folder like a GEC Bullnose, Yankee Jack, or Huckleberry Boy's Knife. In colder weather where I'll be consuming more wood to keep warm, I'll add my Bob Destrude buck saw. Well My Ontario SP8 is 550 corded to my pack. Since thats No knife mate, I guess the Mora Clipper around my neck. Sounds a little strange but I like a sharp on each side. So, left front pocket is a SAK explorer, right front pocket a Byrd Cara Cara (made by spyderco) with pocket clip. On my left shoulder strap is a Mora compaion HD or I will carry my benchmade bushcrafter somewhere. On the outside of my packet a Plumb or Homestead hatchet or a Gerber brush tool. In the pack is a folding saw. It depends on how much I want to build fires and bushcraft. On my trip over New Year's, I took my LT Wright GNS and a Bacho folding saw and enjoyed a nice fire on a long winter night. 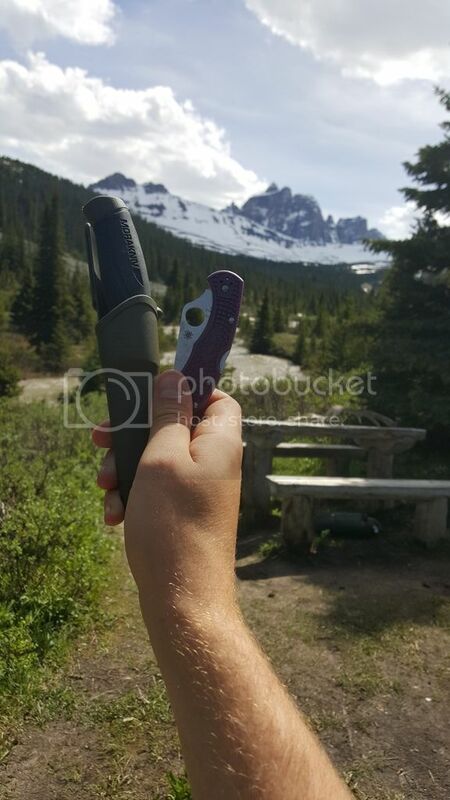 On my trip last weekend, I took my EDC knife, which a mid-sized Buck with a belt clip. I still enjoyed a fire, but from smaller wood. Even if I won't be building a fire, I always like to at least have a small knife. A SAK Farmer. Sometimes a Mora fixed blade comes along on longer trips. Chopping wood is something I haven't needed to do where I hike and canoe. If it ever is, I'll use the wood saw of the Farmer. If I plan on making camp fires while I'm out I take a KaBar heavy bowie and a bacho laplander, along with some sort of a pocket knife or two. ESEE 4 on my belt and an IZULA as a neck knife. I changed up my choices I didched the gerber clutch as it was kind of poor quality. I now have a mora companion lashed to my pack and a delica in my pocket. It's a versatile and reasonably lightweight combo. Based on your edited OP, I think our definitions of "backpacking" are completely different. My knife for most of my kind of backpacking is a flyweight knives titanium knife with ultra light neck sheath. I mostly backpack the high Sierras and I'm not building bonfires, or building a cabin to sleep in every night. Sometimes I bring my fishing/hunting knife. A Scandinavian belt knife. I might be a little biased, but my "one blade option", surviving on "Alone" knife would definitlely be Evan Siembida's Raven model. That blade is the most capable knife I've ever used. It can chop, it can slice, it can dice. That thing is tough as nails and as nimble as a Mora. Hands down the most versatile knife I've ever used. Mora bushcraft survival + Bahco Laplander. I think they're worth the weight. I like to have basic gear with me all the time in case something hits the fan. This would be my choice. evidrine84, Denman and big belly jon like this. My experience in the field is to anticipate that, "Any thing can happen I didn't plan for"
And with that in mind, I take my bowie hunting knife ever time I enter the woods ,long term or short. Timex and big belly jon like this. That's a nice Bowie. 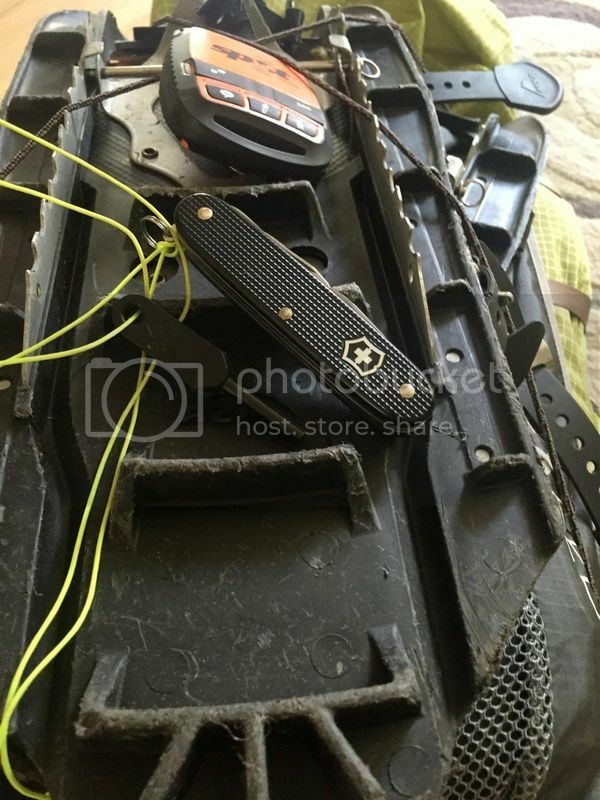 Any more information on it? I carry the Schrade schf9. It's a big heavy thing. 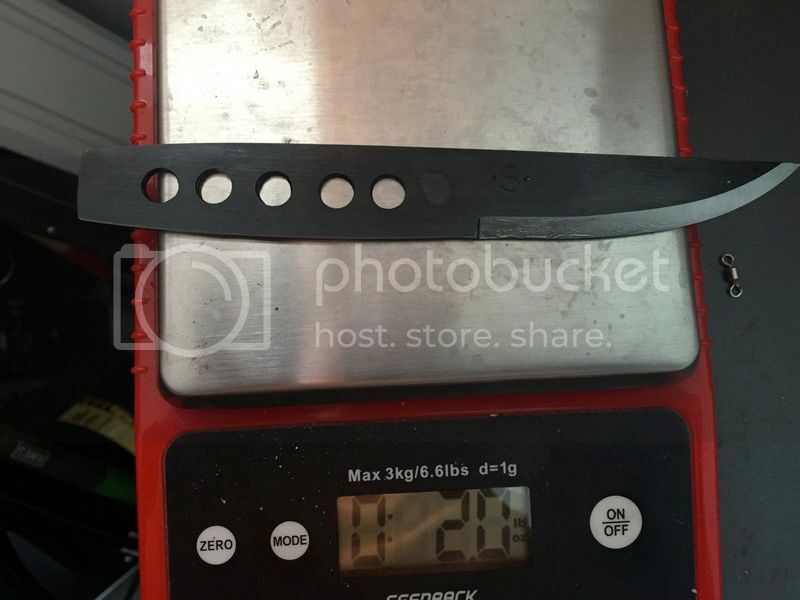 6.5 inch blade. Weighs in at almost a pound I believe. But with a quarter inch thick blade, you aren't going to second guess if your blade will be able to handle whatever you throw at it. It really depends on what you're planning on doing. My typical back-packing trip is all about walking through the mountains most of the day, enjoying the views and getting some exercise. We'll stop at a shelter area in the afternoon and spend the evening fraternizing with my buddies. There isn't much of a need for a knife any bigger than a SAK for small chores. If you can't get a fire going it's no big deal because we have sleeping bags, tents and small stoves to cook our food. Half the time you're too tired from walking all day to screw around much, and the shelter areas have been totally picked clean of wood for hundreds of yards anyhow. The sun goes down and you go to sleep. On the other hand, if you're objective is to back pack a little to a remote area and set up a base camp or practice bush-craft skills, you're going to want the full arsenal of woods tools with you. Generally, the more bush-crafty you are, the less back-packing that's getting done. In other words, if you're spending a lot of time building shelters, chairs, spoons, fires, ect, you're spending less time back-packing. Everyone has a different objective with backpacking and different kits to accomplish that goal. However you do you back-packing, it's all about having fun anyhow right. This year I'm doing 42 miles on the AT. In addition to my SAK, I'm actually bringing a bow saw blade and two key rings to fab a bow saw if I have any extra energy. It will totally be a screw around in the woods for fun, pack item if it even gets used. I carry some kind of SAK with a saw. I have never needed anything more on a backpacking trip. Now camping is a whole different story. caoutdoorsman, big belly jon, Crooked Penguin and 1 other person like this. I've had the knife for over 40 years . 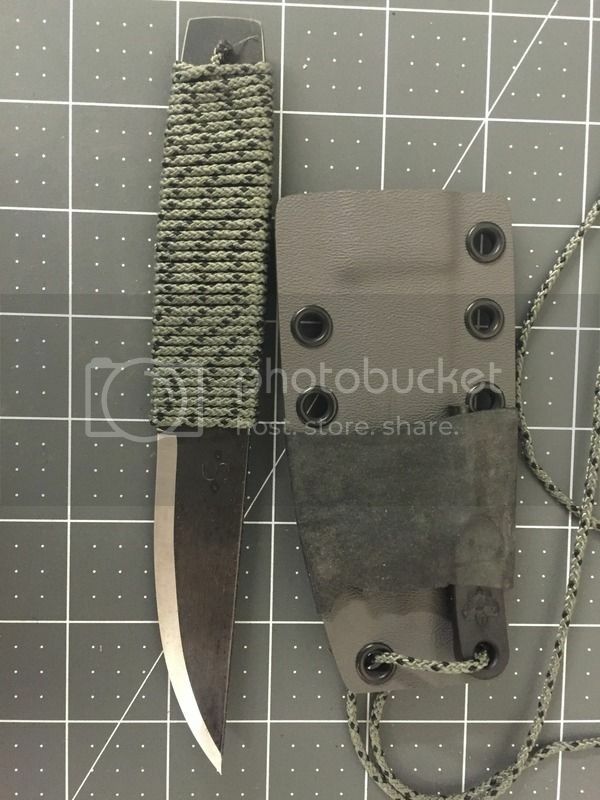 The Bowie I had before that was made by "Case"
ESEE3. It fits in my pocket well. It is well sized for small to medium cutting tasks. It has not moving parts to fail. It holds an edge well and is easy to sharpen. It had become my Victorinox Farmer for some time, saddly I've misplaced recently. The awl is very useful and holds up to all sorts of abuse. I find the opener layer useful personally, and the knife blade is more than adequate. The saw in my case allows me to leave larger saws at home. I don't enjoy sawing through large rounds and so a saw is used for finer work rather than wood processing. I always tend to bring my Mora with me as well, but to be honest it's not really needed. I took theese out for some trips recently. Definetly used the delica more than the mora but I kind of like the piece of mind knowing that I can do some fire prep if need be. big belly jon and JasonAVGuy like this. 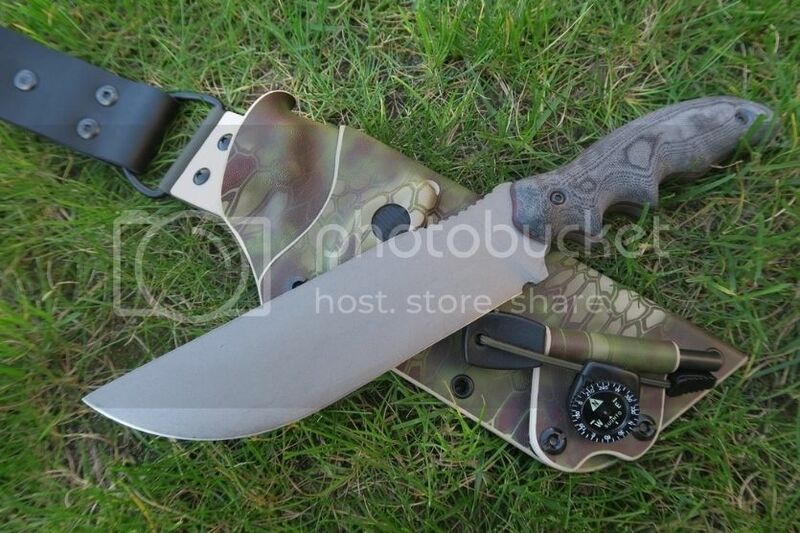 Wasnt the Bowie design a fighting knife more than a hunting knife? They are rather unwieldy aren't they for small tasks? For me it would be my SAK Fieldmaster. There are lots of choices in the SAK family to choose from, but this one is ideal for my purposes. It is light and has two blades, scissors, saw, tweezers, and an awl. They take care of most things I run into. Mora Craftline SS. And or shrade 440 izula knockoff. In the winter my sp8 comes along. You are the second or third person to mention the SP8. That is an interesting looking blade. It almost looks like a distant cousin of a froe. While I'd probably choose something lighter for backpacking, I still think that old W49 is a classic thing of beauty. And in defense of your choice, if you look at some of the big choppers guys are carrying today, you're old gal isn't excessive at all. I can only imagine all the wonderful memories you've racked up over four decades of carry. Depends on the environment, here in Florida if I'm gonna be somewhere with salt in the air, I'll bring my Buck 119. Anywhere else I have an Ahti leuko, or my Jeff White camp king, both carbon steel. I like to bring a small Tomahawk as well, they don't weigh much and processes fire wood like a monster. Moro companion. Or a kershaw folding knife. I like having a backup. Honestly I don't backpack any more but if I did I'd take a Mora. Light and would do anything I needed. BradGad, JakeStone, big belly jon and 4 others like this. I normally carry my ESEE 3 and SAK Farmer for backpacking trips. So I'll put it to you this way: You've just been selected to be on season 3 of Alone - what is your one blade that you bring along? If I was going on season 3 of Alone I'd most likely bring my Gunner 12, however, this is not what I usually bring for backpacking. Denman, big belly jon and sonnyDdog like this. I am into Lightweight Backpacking (just can't quite get into UL range, probably because of the following) but even on a simple dayhike in the state park, I like to have a knife or two on me. You never know when a nice piece of chaga, or some good fatwood, or even some cattail roots may show themselves! I EDC a multitool, so there is always a skeletool or Wave or some form of SAK on me, and then I usually have either a small fixed blade like an Izula, or a bigger 'crafty knife of one flavor or another. My personal fav for many years now is the Fallkniven F1. It is just the perfect weight, size, and form for me. When going out for any sort of real trip, I carry the F1 and a folding saw. In the SE US, that is all I really need for most any job.